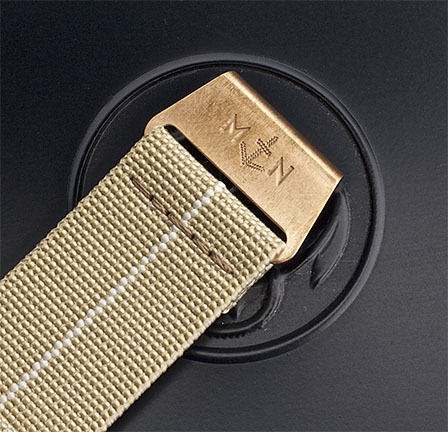 I offer five buckle options to match your watch's finish or to personalize your MN™ Strap. 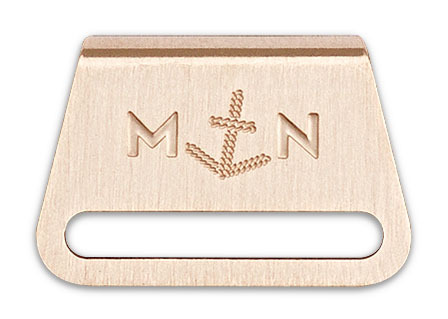 All my hardware is made from sea water resistant 316 stainless steel or solid marine grade bronze. 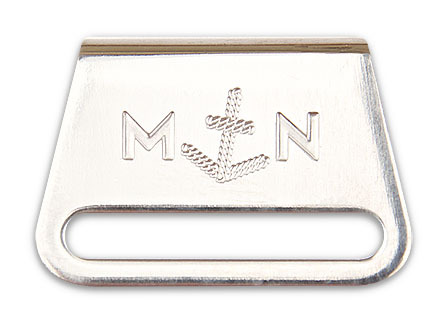 You can select the material and finish of your buckles during the order process of your MN™ Strap. 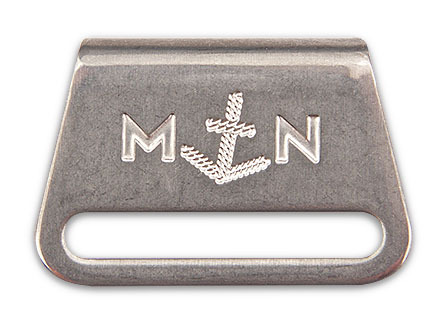 In keeping with their military heritage all my buckles are made using traditional manufacturing methods as used by the French Airforce and Marine Nationale. All my buckles are hand finished. Small microscratches may be visible with flood light due to the production process. Brushed Stainless Steel. Works great with brushed or satin finish watch cases and tool watches. Also less prone to scratches. Patina or aged Stainless Steel. 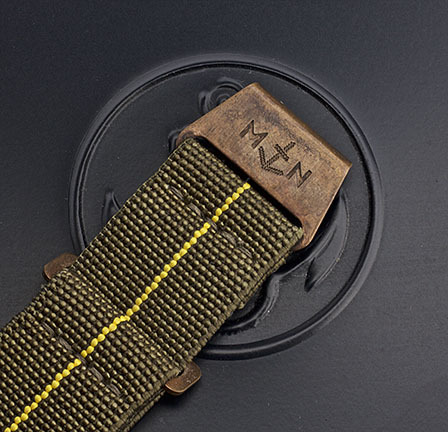 Resembles the hardware found on battle worn parachutes. This is a very good match for sandblasted and titanium watch cases. Polished Stainless Steel. A very good match for polished watch cases and high lustre dials. Black DLC coated brushed Stainless Steel. For black watch cases or one of my Black Ops straps. My customers often ask me what to expect from the patina of my bronze buckles. 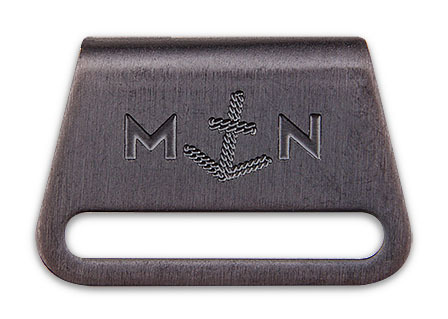 So here it goes… My bronze buckles are made from solid CuSn8 bronze. This marine grade bronze is the same material alloy as for example Panerai watch cases. This kind of bronze will patina very easy with beautiful tones of brown and black due to a.o. the amount of zinc in the alloy. Tudor watch cases for example patina more slowly because their alloy contains aluminium. Still my bronze buckles work great with Tudor and other bronze cases as well. 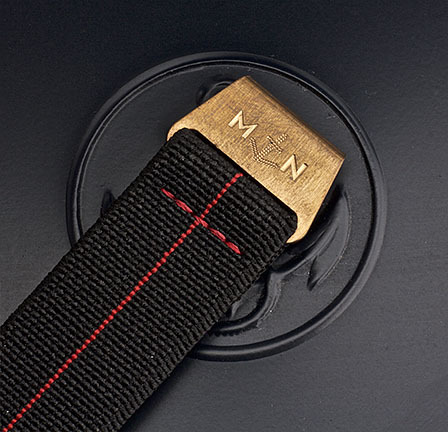 When you receive your MN™ Strap it has a coating to prevent it from oxidizing during stitching and transport. This way you can experience the full patina journey of your strap. The coating wears of easily but can also be removed with a little water or alcohol. Each patina will develop differently, depending on the pH value of your skin, your location, your activities and how you wear your watch. The above pictures will give you an impression of what you (can) expect in 4-8 weeks. 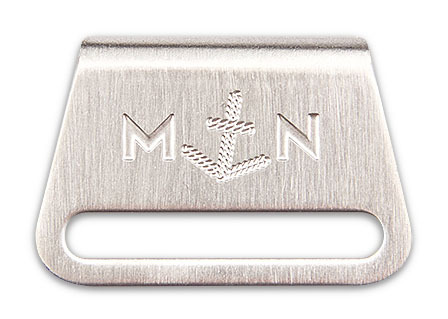 In keeping with their military heritage all my buckles are made using traditional manufacturing methods as used by the French Airforce and Marine Nationale. All my buckles are hand finished. Due to the softer nature of the bronze material small microscratches and pitting may be visible with flood light due to the production process. These will go unnoticed once the bronze has aged. The information materials and opinions contained on this website are for general information purposes only, are not intended to constitute professional advice, and should not be relied on or treated as a substitute for specific advice relevant to particular circumstances. Erika's Originals does not accept any responsibility for any loss which may arise from reliance on information or materials published on this website. Certain parts of this site link to external internet sites, and other external internet sites may link to this website. Erika's Originals is not responsible for the content of any external internet sites. Copyright (c) 2016, 2017, 2018 Erika's Originals. The designs and materials published on this website are unless otherwise stated the intellectual property and copyright works of Erika's Originals. You may make copies of materials published which are of interest to you for your own personal use and you may provide occasional copies of individual publications (in paper or electronic form) to others for information purposes only provided that you do so free of charge with a reference to our website. When you do make copies for yourself or others, the content of the published material and the copyright notices must remain intact, your communication of the content must not be misleading or inaccurate and a copy of this notice must accompany any copies of the materials which you provide to others. You may not republish any content or material available on our website on any other public website or alerter service without our prior written consent. You may not create a link to any part of our website, without our prior written consent. No other use of the materials published on this website is permitted without the express prior written consent of Erika's Originals. When ordering on our site, as appropriate, you may be asked to enter your name, email address, mailing address, phone number or other details to help you with your experience. I offer a 6 months limited warranty guarantee on all my products. Items made from vintage or second hand materials have a limited warranty of 2 months. If you find there is a problem with one of my products please email me, I will do my best to resolve any issue. Unfortunately I can not accept returns on custom and made to measure items. This website (including this disclaimer) shall be governed by the laws of the Netherlands. Dutch courts shall have exclusive jurisdiction over any disputes arising from this site.